Posted on May 16, 2011 at 07:58. Tags: 9.1, extensions, pgcrypto, postgresql. One thing I've really disliked is the fact that contrib modules had installation scripts that enforced the schema to public for the installation. In my opinion, for no useful reason at all. For example, I often install the pgcrypto contrib module. And I install this in the pgcrypto schema, that I then either add to the search_path variable or just explicitly use in my queries, with things like pcrypto.crypt('foobar','barfoo'). For versions prior to 9.1, being able to do this required me to manually edit the installed pgcrypto.sql file, to remove the SET search_path = public; command. If I happen to create it in public by mistake, I can even move it after the fact! You still need to create the schema manually - in theory we could auto-create that, but the work is still a lot easier than before. And fully supported! Posted on May 2, 2011 at 19:05. Tags: 9.1, extensions, fdw, logging, postgresql. PostgreSQL 9.1 beta1 now available - now is a great time to start testing it, and trying out all the great new features. There have always been a number of ways to read your PostgreSQL logs remotely, over a libpq connection. For example, you can use the pg_read_file() function - which is what pgadmin does. PostgreSQL 9.1 adds a new and more convenient way (in some ways) to do this - using SQL/MED. PostgreSQL 9.1 comes with SQL standard SQL/MED functionality. The MED in is short for "Managemend of External Data", and as the name sounds, it's about accessing data that's external to the PostgreSQL server. The SQL/MED functionality is not (yet) complete, but it's already very useful in it's current state. In SQL/MED, there is something called a Foreign Data Wrapper, that can be compared to a driver. Using this FDW, we can create one or more Foreign Servers, which is a definition of how to connect to a specific instance of the service - if any. Finally, we can create one or more Foreign Tables on each of the Foreign Servers, giving us direct access to the remote data using SQL. Posted on Apr 27, 2011 at 19:02. Tags: core, postgresql. As has just been announced here, I was recently invited to join pgsql-core, and have accepted. Anyway, I'd like to thank the guys in the group for showing this trust in me, and shall do my best not to screw it up! Posted on Apr 12, 2011 at 08:13. Tags: conferences, pgconfeu, pgconfeusite, pgday, pgeu, postgresql. It's time to mark your calendars: PostgreSQL Conference Europe 2011 (formerly known as PGDay.EU) will be held on October 18-21 at the Casa400 Hotel in Amsterdam, The Netherlands. Like last year, the conference will be held in a hotel venue, combining both the conference rooms and guest rooms, so you don't have to waste any time finding your way around the city. As in previous years, the conference will include full catered coffee breaks and lunches, to make the most of the time. The first day of the conference will be a training day, and the following three days will be regular conference tracks. The conference will accept talks in English, Dutch, German and French, to benefit those attendees who prefer talks in their native language. We are just starting our search for sponsors - if you are interested in sponsoring the conference, or know someone who is, please take a look at our sponsorship opportunities and don't hesitate to contact us if you have any questions or would like to propose an alternative arrangement. We will also follow up with a call for papers later, and in due course open for registration and post a conference schedule. For now, mark the dates, and follow the news on our website and on our twitter stream @pgconfeu. Posted on Mar 14, 2011 at 12:20. Tags: conferences, jdcon, pgeast, postgresql. Next week it's time for PgEast: 2011, this time in New York City. I've already outlined why the East part of "PostgreSQL Conference East" (as it was called at the time) is incorrect: as is obvious to anybody with a basic knowledge of geography, the conference is to the west. From what I can tell, it's approximately 74 degrees west of zero, which means it's more than 20%25 of the world to the west. In expanding this scope, it seems JD has this year decided to get the rest of the name wrong as well, in a bid to get more people. Just like it's 20%25 of the world wrong in location, it's no longer a PostgreSQL conference. Instead it's more of a cross-database conference, with an entire track dedicated to MongoDB (incidentally, approximately 20%25 of the tracks, it seems). Is that bad? Absolutely not - I'm looking forward to sneaking in on one or two of those MongoDB talks. But I think it means we have to go back to the proper name for the conference - JDCon-East! And I'm sorry JD, but whatever numbers you get, you will not be the biggest PostgreSQL conference around. We are going to have to leave that title where it belongs - with the Brazilians (for now). I will also be giving a talk during the regular conference, Data Driven Cache Invalidation. There's plenty of PostgreSQL - and MongoDB - around for everybody at this conference, so if you're anywhere nearby New York City, there is no reason not to be there! Posted on Feb 18, 2011 at 16:34. Tags: . This post is to confirm that planet.postgresql.org is now running off a new host. Posted on Jan 30, 2011 at 10:37. Tags: intrastructure, postgresql. and along with them, a few other services. From what we can tell, what has happened is that the datacenter that hub.org hosts most of their servers in, in Panama, dropped completely off the Internet several hours back. The PostgreSQL mailinglists are managed by hub.org, and is tied into their main infrastructure. For this reason, there is nothing the rest of the sysadmin team can do other than wait for the situation to resolve, and we unfortunately have no chance to bring up any backup servers anywhere. As an added unfortunate bonus, it seems at least one of the hub.org nameservers is still running an incorrectly configured DNS zone file. This means that while this server is geographically hosted elsewhere, like it should be, email will get delivered to that host and then bounce saying that the postgresql.org domain does not exist. This is incorrect - the domain itself exists and works perfectly well, and if it wasn't for this incorrect zone file mail would be queued up and delivered once the main datacenter is back up. Along with the lists, a few other services hosted with hub.org are currently unavailable - pgfoundry.org, pugs.postgresql.org, the developer documentation, jdbc.postgresql.org and possibly some other minor services. All other infrastructure services are operating properly, including the website and the download mirrors. Please be patient as we wait for hub.org to resolve this issue. For any up-to-date status information your best bet is the #postgresql IRC channel on FreeNode - but people are unlikely to be able to provide any information beyond "it's down, and we're waiting for hub.org". Posted on Jan 18, 2011 at 12:13. Tags: pgindent, postgresql, ubuntu. For those who don't know, pgindent is the tool used to indent the source code of PostgreSQL. dash is the shell that ships as /bin/sh on at least Ubuntu. pgindent requires indent from BSD (we use a patched version from NetBSD, the source is available on the PostgreSQL ftp site), and specifically does not work with GNU indent. Guess what Ubuntu ships with. Spot the error? Yeah, that calls /bin/sh, which is dash. Which gives some really interesting results with pgindent, none of which are what you expect. So if you run pgindent through a script like this, be sure to use /bin/bash and not /bin/sh! Posted on Dec 28, 2010 at 11:57. Tags: conferences, pgday, pgeu, postgresql. Several people mentioned it was bad that the two sets of rooms (Berlin vs non-Berlin rooms) were very far apart. This is definitely something that we noted, and will attempt to avoid next year. A few people mentioned that it would be nice if the hotel was closer to the city center. This is definitely true - unfortunately, closer to the city center means higher prices. We hope to find something closer to a city center at a reasonable price next year - by making sure we start to look and book early enough. A few people commented that we shouldn't hold this in northern/central Europe in December due to weather (snow anyone?). Our goal is to move the conference back to an earlier date during the autumn - again, the main reason we ended up in December this year was that we started looking for a venue too late. A couple of people commented that the hotel room rates were too high at the Millennium. There were cheaper hotels around to use - but of course, those aren't as convenient. This wasn't helped by the fact that the hotel group rate dropped off the hotel website twice, causing some people to get their reservations at a higher rate. Isolated people commented that they did not like the hotel - "too big, unpersonal" and "feels like a prison". Amongst the positive ones we find a large number of comments saying that the "integrated venue" or "all inclusive" venue was a great step up. Closely related to the venue, is the food. Unlike the big north American conferences PGCon and PG-East/West, we have for the past two years tried to provide proper lunches and not just sandwiches/boxed lunches. This obviously costs more money, but we believe it's worth it, and we think our visitors do. Last year we had a catering firm bring us assorted food, mainly cold cuts, at the conference venue, and this year we got proper lunch buffets (including multiple choices for dessert, of course..) at one of the hotel restaurants. I think the ratings speak for themselves - I would encourage those other conferences to look into improving their lunches as well! 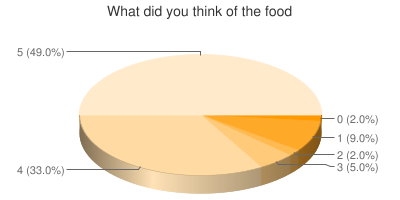 There was, however, one person who said the food was one of the worst things about the conference - if you recognize that was you, we would very much like to know exactly why (no details were included) - please send me an email or write a comment here! A few people commented on the large amount of food left over from lunch on at least one of the days - it is up to the hotel to decide what to do about that, but it is our belief that they do something "reasonable" with it - and not just throw it away. We know that the caterers last year delivered all leftovers to a nearby homeless shelter, for example. For next year, we will attempt to again get a specification from the catering/restaurant as to what happens to leftovers. Obviously, we see a bias towards Germany - since we were in Germany this time. However, we are only going back to Germany next year as a last resort - we want to move around. We will eventually come back to Germany of course - but not next year. Some people commented that they will not be able to attend in a country other than Germany because they wouldn't understand the language of the talks. To deal with this, we are considering adding non-local-or-english talks as well for next year independent of where it is - where German talks (along with French and maybe Spanish) would be included even if the conference isn't in Germany. 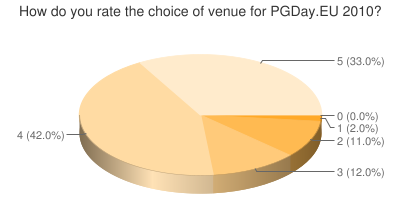 Our Germany community is also looking into creating a specific PGDay Germany next year, which will be a smaller event focused on the local market - something we as PostgreSQL Europe will help and encourage. 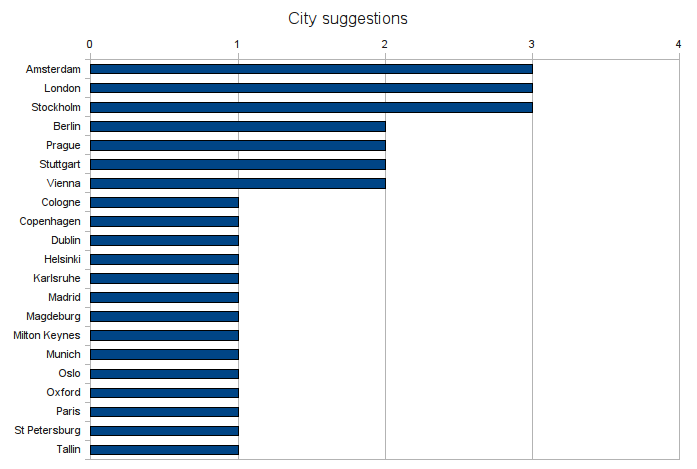 I'm surprised to find Stockholm so high up on the list - I promise I didn't put any of those votes in there myself! It's good to note that all the cities having 2 or more suggestions were already on our list of places to look at for next year. We will consider this input and start looking for venues. This time we will not attempt to decide and announce a city first and find a venue later, we'll do it in the other order. A few people commented they wanted non-paypal registration options. While the paypal system we use actually allow you to do a credit card payment without the need to sign up for paypal (which some people did not realize and thus sent us an email before registering asking about it), not everybody has a credit card (this is not America - or Sweden). We'd be very happy to hear suggestions for what to do here though - we've looked at many different options, and paypal turned out to be by far the best one. We need something that supports automation and is reasonably fast. We did also support bank transfer in extraordinary cases - but that's not something that can be automated (unless you are a much bigger customer to the bank than we are), and it takes a long time for some payments, since they have to cross borders. So - any suggestions are welcome, and our core registration system is designed to support multiple payment methods. 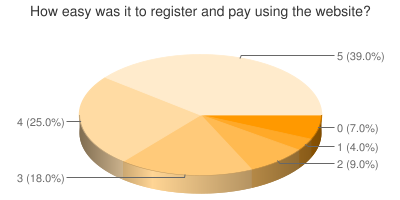 Nobody actually wrote in the conference feedback that we lack a good interface for bulk registration, but we are aware of this - we had a few (less than 10 in total) entities wanting to register more than 2-3 persons at the same time for a single invoice, and our current system does not provide a reasonable way of dealing with this. This is definitely something we need to work on for next year. It's been suggested we add a "skill level" entry to each talk, to make it easier for an attendee to know if it's a beginner or advanced talk. This is definitely something we'll look at doing for next year. One suggestion is we include a full list of all attendees including their email address in the conference handouts, to make it easier to contact each other. This is not something we're going to do as a general thing, since we don't want to go distributing such lists. But we may consider adding it as an opt-in feature, where you can choose on registration if you want to be included in such a list. We need to make it more clear that 5 is the best and 1 is the worst on the feedback forms. We know a few people filled them in wrong (we hope it meant they gave us bad rates when they meant good, but we don't know that), and it was also mentioned in the feedback. Freetext comments: "The overall organization of that event was excellent." "Very good organization, great people, interesting talks, vibrant community in general. Lots of core dev presents, high level of knowledge." "Great organization from beginning (registration at the website, information prior to the event), arriving and registering (internet access already available, great t-shirt and backpack) to the conference itself (sessions, warning speakers about how much time is left), good food and drinks at the breaks and at lunch. Kudos to the organizers and everyone who helped make this happen." "I think the organisation was perfect. There where many people and all know where they had to go to." "The huge amount of information, inspiration and positive energy. Actually I hacked my first patch on the way back." "The people especially the staff :) Both keynotes were stimulating good dsicussions with my peers" "Very good conference. I felt really cosy there. As a noob to PG, I got a lot of information and I lost the fear of asking the experts (either on the mailing list or on IRC)." "The organization was really great. Maybe the best PostgreSQL conference I've attended so far." 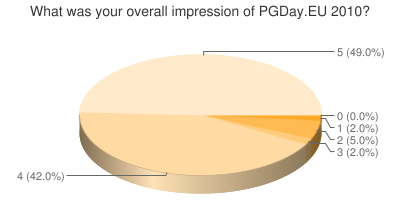 That concludes my summaries of the feedback from this years PGDay.EU conference. If your specific comments haven't been called out here, don't worry - we still read them all and will consider them all for next year! Finally, thanks again to all who helped make this conference great!